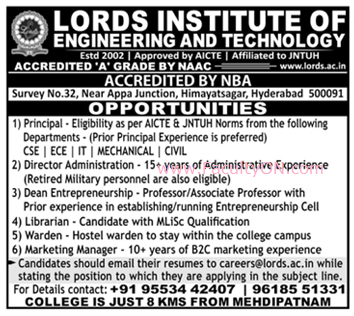 Lords Institute of Engineering and Technology, Hyderabad has advertised in the DECCAN CHRONICLE newspaper for the recruitment of Principal / Director / Dean / Librarian / Warden / Marketing Manager jobs vacancies. Interested and eligible job aspirants are requested to apply immediately from 27th September 2018. Check out further more details below. College Profile: Lords Educational Society has established Lords Institute of Engineering & Technology in 2003. The college is situated at Himayathsagar, Hyderabad. Located just 7 Kms, from Mehdipatnam. Adjacent to ORR-Shamshabad Airport, Police Academy and is located in serene surroundings of Himayath Sagar. The building consist of 2,50,000sft with all facilities that foster education amongest students. How to Apply: Interested and eligible candidates are requested to send CV along with copies of certificates from X std to Degree, PAN card and recent PP size photographs to the following email address. Candidates should mention the post applied for in the subject line of email.